Two things could not be stopped during Grace’s NCCAA Pool Play match against Columbia International on Monday, November 26. One was the seemingly unending downpour of rain. The second was Cody Boerema. 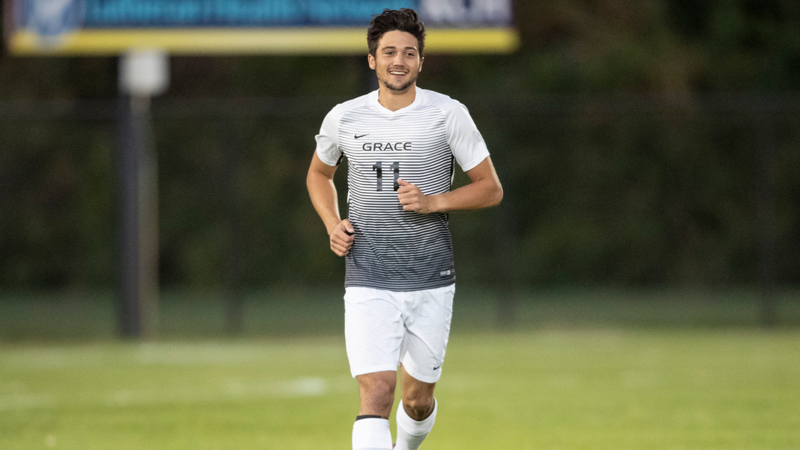 Boerema had a part in all three of Grace’s second-half goals, leading the Lancers to a 4-2 victory over Columbia International. The Lancers (14-3-4) sit atop Pool B at NCCAA Nationals after Monday night’s win with one match remaining. Grace can clinch the pool — and a spot in the national semifinals — with a win on Wednesday against Ottawa (Arizona) at 5 p.m. The winner of each of the three pools along with the top overall runner-up, will play in the NCCAA semifinals on Friday evening. Grace stunned the Rams (11-9) with an early goal on Monday. The Lancers won possession deep in CIU’s end of the field, and Grace advanced quickly. Marcelo Talamas trapped a ball at the top of the penalty box, pivoted toward goal and unleashed a hard blast inside the far post just 3:56 into the match. Grace, who had 11 shots and six shots on goal in the first half, held the better of possession and chances throughout the opening half. But the Lancers were held to one goal before halftime. With 10 minutes left in the first half, lightning struck in the vicinity which forced a mandatory stoppage of play. The delay lasted close to an hour. The lengthy delay seemed to give the Rams life. CIU scored on the first corner kick after the restart in the 36th minute to level the score. The teams entered halftime tied 1-1 despite Grace’s 11-6 edge in shot attempts. The Lancers continued their pressure on CIU’s backline, and the attack eventually crumbled the Rams’ defense. Damon Binkley tried a curled shot from the left side of the field that whizzed past the far goalpost. Minutes later, Grace had another lengthy buildup. Joshua Coupar crossed to the center of the penalty box to an unmarked Cody Boerema, but Boerema’s one-time volley went wide. Boerema proved to be too dangerous for the Rams in the second half. He scored the go-ahead goal not long after his missed shot. Colin Cape sent in a long pass from midfield toward Boerema, who found space near the right corner. He cleverly maneuvered to reach the penalty box and was promptly fouled on his approach to goal. Boerema stepped up and converted the ensuing penalty kick for Grace’s second goal. Just a short while later, he made a similar move in the center of the field and was again taken down. This time Ulisses Miranda took the 20-yard free kick and blasted his shot above the goalkeeper in a perfect position for a 3-1 lead. The floodgates seemed to open up figuratively for Grace as the rain continued its downpour. Boerema received the ball at the right edge of the box with just one defender in his way. Boerema made a deceptive stepover, crossing up his defender and then slicing in his shot to the far post in the 79th minute. Grace had three more chances to add to its lead, keeping pressure on the Rams. Miranda nearly scored twice, including once with the final kick of the match, and Joshua Coupar also had a close-range shot blocked. The Rams cut into Grace’s cushion with a goal in the 84th minute, scoring off a rebound. But the damage was already done in the Lancers’ 4-2 win.